If you’re looking for some great infographic video ideas, here’s a ton of research we did on the different types to get you inspired. Let’s face it, most people love a good infographic and there are some compelling statistics to convince you why you should use them. If you combine sound, moving graphics and text, you’re stimulating three different parts of your viewer’s brain at once, which helps with understanding and retaining information, and keeping people interested in your message. But how to approach creating an infographic video? There are a number of formats you can try, and your approach will largely be governed by the kind of information you’d like to present. 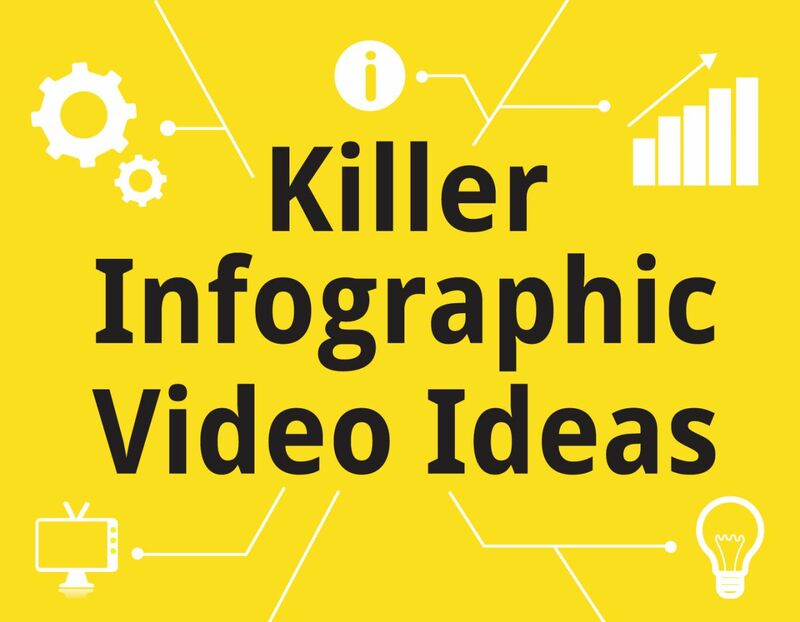 Here a couple of different infographic video ideas to kickstart your design-thinking. This method merely presents facts in a visual format, but is heavily weighted toward text. Really, with this design, you’re just presenting text in a more attractive way by giving it some colour and movement, but the graphic visuals have very little to do with the words. This is a good format for when your information is very text-heavy and is quite difficult to transfer to visual information. This is one of the most popular forms of video infographic, for good reason. People love statistics and their basis in fact make them hard to argue with. This is a very scientific approach and one that is therefore quite believable and credible to audiences. If you can get your statistics from a reliable source, this is definitely one of the better ways to go. Similar to statistics, this is a more visual way of presenting information where the visuals outweigh the text in importance. Put simply, you have to make the picture tell the story almost without using any text at all. It’s one of the best and most interesting forms of infographic but has significant drawbacks. The complex, custom visuals you will need to produce a video like this will be difficult and time consuming to produce, and will need to be painstakingly planned out before you even start to make the video. This format is the placing of two things side by side and measuring their respective merits when judged by the same criteria. This is the perfect format if you’d like to compare two (or more) things and highlight their differences. Usually the two things are presented onscreen at once, with their respective statistics measured with text, but they could be presented one after the other on the video timeline. When your information or data is chronological, the go-to style is the timeline. Most timelines are visual, presented in a long, single line that allows you a quick visual reference of where the events are in time, relative to all other events. Another less used but equally compelling form of timeline is the time lapse timeline, in which events are presented one after the other on the timeline of the video relative to the time they happened in reality. When your information is based geographically, it’s obvious you should use a map to represent your data. The most common form is a map with colour-coded regions or icons. This is the ideal format to represent differences between countries or regions, and when combined with a time lapse format, is ideal to represent expansion, progression or change. This is a step-by step guide to how something works or how to do something with accompanying visual representation. It could be anything from how to fix a flat tyre to how to cook recipes. This has become an extremely popular form for how to cook videos, with simple, bird’s eye views of the process instead of focusing on the chef and/or host. This can be anything from a top 10 or just a simple list. This format can work well in a video because you’re able to present the items in the list one by one, building tension and ramping the intensity up to a big reveal at the end. These are quite popular on the internet because they are usually fairly short and punchy, and can be digested easily, making them perfect click-bait. A relatively new entry into the field of infographics, this format uses a photograph or some live action footage overlaid with text. Often the overlay moves with an object in the footage, giving the impression that the overlay somehow exists alongside the person or object, becoming part of the scene. There are a lot of reasons why infographics are a great way to present information. With so much data at our fingertips, it makes sense to design it to stand out. They’re also more easily digested by the viewer, therefore doing the job of communicating ideas better, and, let’s face it, they’re just more fun than having reading some dry text or having something explained to you in a monotone by a man in a tweed jacket. So now you’re more familiar with the landscape, pick the format that suits you best and get creating!